Sea creature out and about! 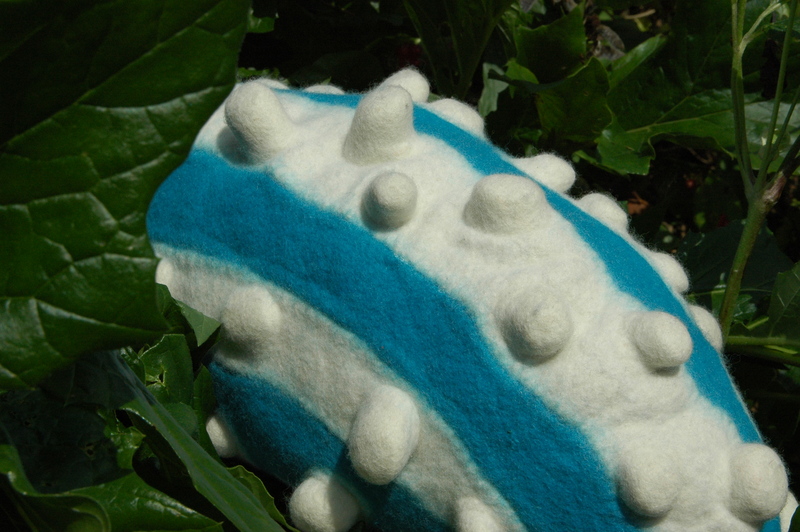 This afternoon I have finally been able to take a couple of pictures of my completed sea creature! I had planned blogging more about Charlotte’s wonderful workshop and the fabulous jewellery session I participated in with Evelyn Refshal but time is just slipping away and felting my large rug is taking up every spare minute at the moment. Over the next few days I will be short on writing but heavy on pictures so please bear with me! Suffice to say that I ran into some MAJOR issues when felting my sea creature. The gauze stretched amazingly due to the high raised bumps and I eventually needed to add some judicious stitching on the inside before working the felt to the finished stage. Note to self, use silk in future for any similar projects, already have ideas swirling around in my head! 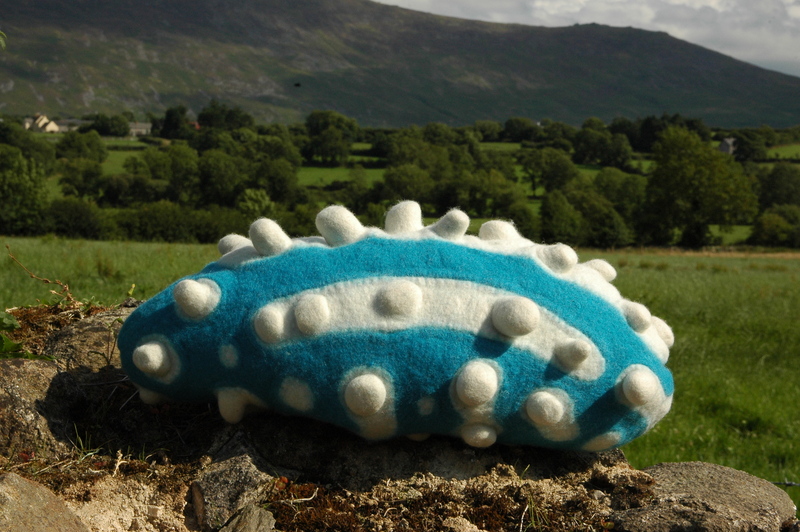 I also had planned adding coral-red points on top of the bumps (check back to see the picture I used for my inspiration) but now that the sea slug is home at Clasheen I rather like the turquoise and white just as it is. I would like to acknowledge the generous support of Carlow Co. Council who helped fund my participation in Grima’s event through the award of a 2010 Arts Act Grant, your support was much appreciated! This entry was posted in awards, Felt, Grima, workshops and tagged arts act grant, Carlow Co Council, Charlotte Buch, Evelyn Refshal, felt jewellery, Naturally Felt, sea creature by Nicola. Bookmark the permalink. you have just created a new specify to the seaworld! Wonderfull and those bumbs, wow! Like the photo on Flickr with the blue sky as a background, makes it all in balance. Haha you have got me now,I cannot see how this emerged from the layout earlier,magic. Wow! Your “slug” is so cool…Never thought I’d hear myself saying that:-) I’m with Chrissie…Amazed by how the layout transforms into such a cool creature. Happy rug felting….You’re going to have great biceps! Ha, that’s funny the world is so small. I remember this sea creature. How was your long,long journey back home? We arrived allready in the early morning, so I had to cook lunch. Nice to see you as well interspace, was there too in Evelyns Revsdahl’s Class.